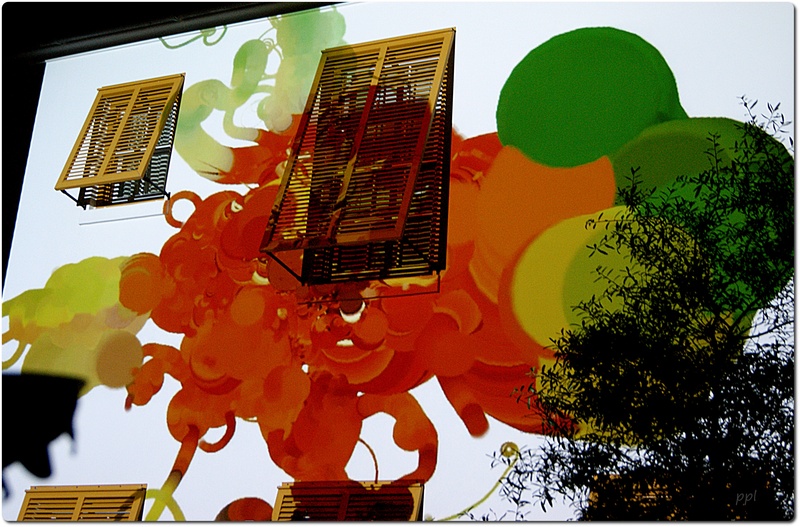 Wall art at Digital Graffiti | Flowers with Tendrils – Don Relyea | Alys Beach | June 2011. A retrospective compilation of some of the most memorable artwork during the past seven Digital Graffiti festivals was featured on the walls of Caliza Pool & Restaurant in Alys Beach during the recent 30A Songwriters Festival which is annually spread across venues on Highway 30A in south Walton County each January. This was in conjunction with award-winning artists from around the U.S. venturing to Alys Beach, January 14-21, 2015 for the third annual Digital Graffiti Visiting Artist Residency program. During the seven-day program, residency artists collaborated with curator Brett Phares to create individual pieces, which will be entered in this year’s Digital Graffiti Festival to be held June 4-6, 2015. The artists included Sean Capone of Brooklyn, New York, Andrew Demirjian of Palisades Park, New Jersey, Natalie Goldman of LaJolla, California, and Shantell Martin of New York, New York. The Digital Graffiti event, has, for the past seven years brought art and culture to Northwest Florida’s Gulf coast by providing a venue perfectly suited as a “blank canvas” for digital artists to showcase their original works.We were there in 2011 and compiled this video. In June, 2015,, finalists will have their work projected after nightfall for three evenings on the iconic white walls, windows, doors and bridges of Alys Beach and will compete for $10,000 in cash prizes, including a $5,000 “Best of Show” award. Last year, 29 artists representing 24 cities in 12 countries on four different continents competed during Digital Graffiti 2014. A panel of judges awarded prizes to seven winners hailing from the United States (Montana and Florida) as well as Canada, Austria, the United Kingdom and India. Digital artisst are invited to make submissions for this year’s event. an oppoturnity to explore how their fluid forms intersect with technology and wrap the architecture of Alys Beach to create entirely new art forms. Guests who attend Digital Graffiti are able to view and at times, participate in, these installments experiencing some of the latest trends in digital art and technology. Digital Graffiti has refined its offerings to include experimental cinema, animated shorts, generative and procedural art. The deadline for submissions is March 16, 2015. For more information on the event, email events@alysbeach.com, call (toll-free) at (866) 481-8390 or visit digitalgraffiti.com.